Denham Awning Makers Inc. is a third generation family business, located in Saskatoon, Saskatchewan. Joseph Denham founded this third generation, family business, in 1938 in the basement of their family home. The business initially specialized in canvas repair, with the entire family pitching in to help out. A short time later, Joseph Denham began manufacturing awnings and tents to expand the business. In those days, awnings were made from dyed woven cottons-with only six fabric colors to choose from. Following the outbreak of World War II, Denham Awning obtained a government contract to manufacture canvas bags for students of the Air Force training school. By 1941, the family business needed additional space and the move was made to new facilities. In the decades that followed, the company continued to diversify, expanding its line of canvas products to include recreational and tent trailers. 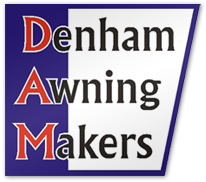 Custom manufacturing has always been an important part of Denham Awning Makers' business. The company has produced everything from tarps for grain trucks to covers for musical instruments. In the 1960's, Denham Awning diversified again, as they began to produce boat tarps for a local boat dealer. It was the start of what is now a major business division of Denham Awning Makers. Mostly through word of mouth, news of Denham Awning's boat tarp business spread, and soon the company was manufacturing custom boat covers for marine dealers from Vancouver Island to Thunder Bay, Ontario. By the mid-1980's, demand was growing for a new type of commercial illuminated or (backlit) awning. Production of these awnings required a welding shop, graphics area and paint rooms. The building was not large enough to accommodate all of the company's activities, and in 1986, the decision was made to move to a new 11,000 square foot building. Denham Awning has also had great success making truck tarps and winterfronts for vehicles, as well as the resurgence in recent years of the residential awning. Today, Denham Awning's boat tarp business continues to grow by leaps and bounds, with the company now entering the U.S. markets. Diversification and a huge database of tarp patterns continue to contribute to the success of Denham Awning. As the business continues to expand production of boat and truck tarps, commercial and residential awnings, winterfronts and custom fabrications, the future of the third-generation family business continues to shine brightly.